Polar coordinates of the form (r, ) identify the location of a point by specifying , an angle of rotation from the positive x-axis, and r, a distance from the origin, as shown in Figure N1–14. 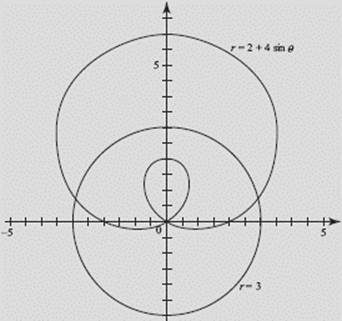 Consider the polar function r = 2 + 4 sin . (a) For what values of in the interval [0,2π] does the curve pass through the origin? (b) For what value of in the interval [0,π/2] does the curve intersect the circle r = 3? This chapter has reviewed some important precalculus topics. These topics are not directly tested on the AP exam; rather, they represent basic principles important in calculus. These include finding the domain, range and inverse of a function; and understanding the properties of polynomial and rational functions, trigonometric and inverse trig functions, and exponential and logarithmic functions. For BC students, this chapter also reviewed parametrically defined functions.